Step aside Chris Hemsworth, the REAL God of Thunder has arrived! Thanks to a fascinating new series released by the Royal Canadian Mint, the traditional image of Thor from Norse mythology returns on a spectacular pure silver coin selectively plated in 24-karat gold. While Hemsworth’s chiseled good looks and rippling muscles have come to define Thor thanks to his myriad appearances as the character in the Marvel Cinematic Universe, the Thor from old Norse legends is quite different. Sure, he carries with him Mjölnir, his mountain-crushing hammer, but that’s kind of where the similarities end. As shown on this coin struck in one ounce of 99.99% silver, there’s more to Thor than just his hammer. You can also see his power belt, Megingjörð, which gives him superhuman strength, and his iron gauntlets, Járngreipr, which allow him to wield his mighty hammer. These are Thor’s weapons and he uses all of them on this coin to battle Jörmungandr, the Midgard Serpent. Each weapon is plated in 24-karat gold to make them stand out form the coin’s gleaming silver surface. If you look closely, you’ll also see a pair of goat heads at the top and bottom of the coin. Those figures represent Tanngrisnir and Tanngnjóstr, a pair of enchanted goats who pull Thor’s chariot. These mystical beasts also sustain Thor in his many journeys as he can eat them each night and bring them back to life the next morning. On the left and right side of the coin you’ll see hammers based on a 10th-century silver pendant that are also plated in gold. Your 2019 Canada Norse Gods – Thor One-Ounce Silver Coin will come in gorgeous Gem Proof condition, meaning it was expertly crafted by the mint from hand-selected planchets, polished dies and multiple strikes to produce beautifully frosted details rising over mirror-like fields. It will come beautifully displayed in its original government packaging from the mint – a maroon clamshell case with a black velvet interior. As the first release in Canada’s Norse Gods series, these One-Ounce Silver Thor Proofs are sure to be in demand by coin collectors, students of Norse mythology and silver stackers everywhere. But with a limited edition of just 3,500 there just isn’t enough to go around. Hurry and order yours now before the end times of Ragnarök descend on Thor and ends his final battle with the Midgard serpent. Hammer one home to your cart today! FIRST RELEASE IN CANADA’S NORSE GODS SERIES – This coin is the first release in the Royal Canadian Mint’s new Norse Gods series dedicated to the powerful gods of Norse mythology. This first release shows Thor battling the Midgard Serpent. His hammer, power belt and iron gloves are plated in 24-karat gold. A pair of goat heads representing the beasts who pull Thor’s chariot and two hammers based on a 10th-century silver pendant are also plated in gold. 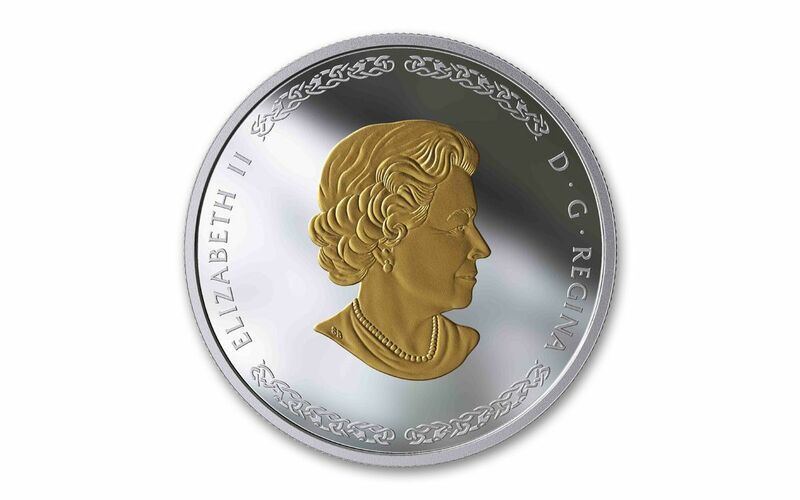 The coin’s obverse features the gold-plated effigy of Queen Elizabeth II. STRUCK IN HIGHLY-PURE SILVER – These 2019 Canada Norse Gods – Thor Silver Coins are struck in one ounce of highly-pure 99.99% fine silver. 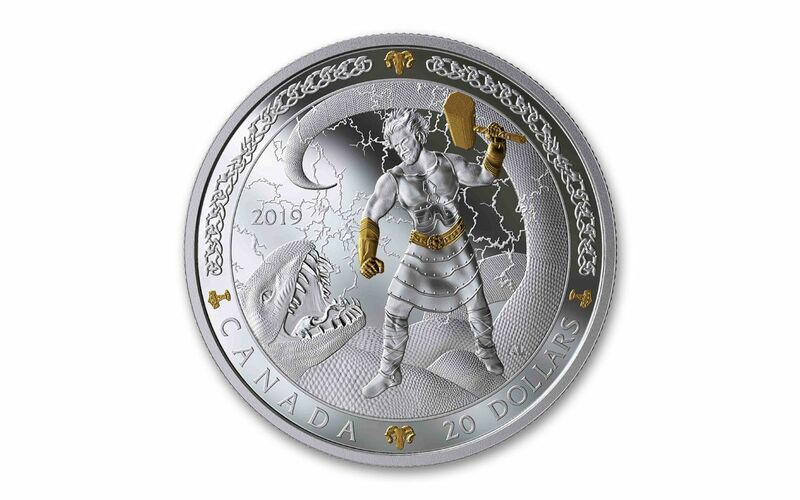 CANADIAN LEGAL TENDER – Each 2019 Canada Norse Gods – Thor One-Ounce Silver Coin is $20 legal tender in Canada. GORGEOUS GEM PROOF CONDITION – Your 2019 Canada Norse Gods – Thor One-Ounce Silver Coin will come in gorgeous Gem Proof condition, meaning it was expertly crafted by the mint from hand-selected planchets, polished dies and multiple strikes to produce beautifully frosted details rising over mirror-like fields. LOW LIMITED EDITION – The worldwide limited edition for the 2019 Canada Norse Gods – Thor One-Ounce Silver Proof is just 3,500. It’s “hammer” time at the Royal Canadian Mint with these exciting One-Ounce Silver Thor Proofs, so don’t forget to click one of these impressive coins to your cart!